Tall, dark and handsome has just arrived. Rich, too. This Double-Chocolate Layered Torte recipe is definitely a keeper! Preheat oven to 350ºF. Lightly grease two 9-inch round baking pans. Prepare cake batter as directed on package. Stir in chocolate. Pour evenly into prepared pans. Bake 30 to 35 min. or until wooden toothpick inserted in centers comes out clean. Cool in pans on wire rack 10 min. Loosen cakes from sides of pans. Invert cakes onto racks; gently remove pans. Cool cakes completely. Cut cakes horizontally in half with serrated knife. Place one of the bottom cake layers on serving plate; spread with about 2 Tbsp. of the jam. 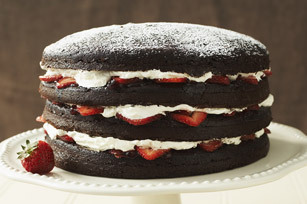 Top with layers of 1/2 cup of the strawberries and 1 cup of the whipped topping. Repeat layers two times. Top with remaining cake layer. Sprinkle with powdered sugar. Store in refrigerator. You'll get a lot of chocolate flavor out of one serving of this delicious torte. Prepare as directed, using raspberry jam and fresh raspberries.